Uganda has two million organic farmers, 200 000 of whom are certified as organic producers, which qualifies them to sell and export their products as organic, and gain higher revenue. There is no reason why South Africa cannot achieve the same, according to Nelson Mandela University’s Professor Raymond Auerbach, whose research over the past 45 years on organic farming and sustainable food systems, has established him as an international authority. He has doctoral students working in Uganda, Tanzania, Zambia and South Africa. Professor Auerbach from the School of Natural Resource Management at Nelson Mandela University’s George Campus, is also a member of the Centre of Excellence in Food Security. “My twin passions are: how can we address rural poverty in Africa, and how can we produce healthy food without degrading farmland and natural resources? The answer lies in agroecology, soil biology and organic or sustainable farming,” says Prof Auerbach from the Agricultural Management Programme, School of Natural Resource Management at Nelson Mandela University’s George Campus. Auerbach is also a member of the trans-university Centre of Excellence for Food Security (CoE-FS), based at the universities of the Western Cape, and Pretoria. 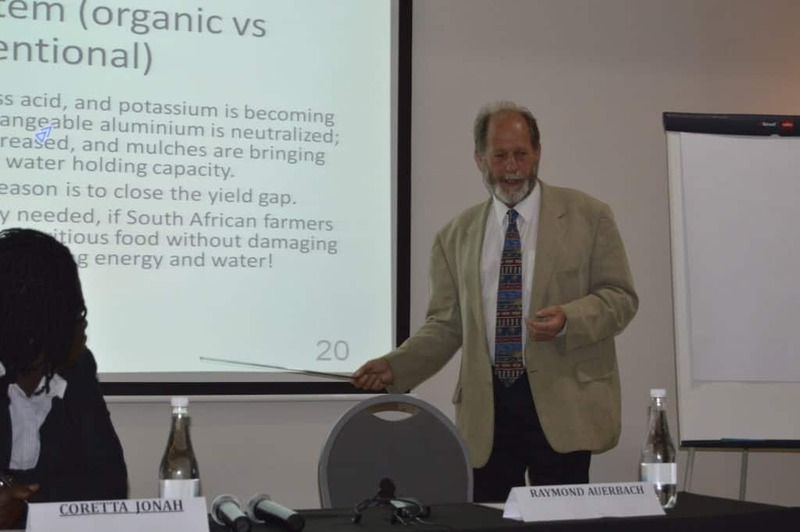 Prof Auerbach, who was an organic dairy farmer for 20 years in the Kokstad region of KwaZulu-Natal says that South Africa needs to accelerate its adoption of organic and natural, sustainable farming methods for a number of reasons, including the development of new farmers and adapting to climate change, with the associated widespread reduction in rainfall. For the past six years Prof Auerbach has been doing long-term comparative organic farming systems trials with his agroecology master’s research group at the University’s George Campus, and the NRF-funded African Organic Farming Systems Research project with doctoral students in several African countries. The research and findings are attracting local and international interest and will be published in a major work by Prof Auerbach titled Organic Food Systems: Meeting the needs of Southern Africa, which will be published as a book this year by the Centre for Agriculture and Bioscience International (CABI). “The research trials in George span 1500 square metres, divided into 40 plots of 6m x 5m per plot. The soils are changing under organic management, and we have been able to close the gap between organic and conventional yields, so that the organic yields are as high as the conventional yields in dry years, and water use efficiency is better. Given the escalation of climate change and the rising cost of fertilisers and poisons, this is essential,” he explains. A true research pioneer, Prof Auerbach, now 65, recognised the need for sustainable, integrated food production and ecosystem services decades ago when he studied organic agriculture in Australia in the ‘70s, and then pursued his doctorate in Agricultural and Environmental Sciences at Wageningen Agricultural University in the Netherlands. He focused on integrated catchment management, rainwater harvesting, sustainable farming and experiential learning. He is a major driver in the development of the South African Organic Standards and Participatory Guarantee Systems, and is a member of the international Organic Food Systems project, which in turn is one of the eight core initiatives of the UN Sustainable Food Systems Programme. Through a new project, funded by the German government, Mandela University is working with local food gardeners, South African organic farmers and the South African PGS Association to assist emerging farmers in implementing these methods and accessing high-end markets, such as the popular Bryanston Organic and Natural Market in Johannesburg. “Consumer groups locally and internationally are expressing increasing concern about food quality, including the amount of chemicals, growth hormones and genetically engineered organisms used in mass food production systems, and their high carbon, methane and water footprints,” he explains. Cows, for example, are ruminants and they need to graze on grasslands, but to speed up their weight gain, they are given growth hormones and fed grain and high concentrate feed in mass feedlots, which produces high methane emissions. Cows that graze on natural grasslands carry a far lower methane footprint and do not compete with humans for grains and proteins. Since 86% of South Africa is grassland, which is ideal for livestock and healthy meat production, we should focus on grass-fed meat production, not feedlots. Our research has shown that a longterm rotation of cabbage, sweet potato and cowpea improves soil health, whereas in the long-term, monocropping with cabbage takes a lot out of the soil. Cowpea, a protein-rich legume crop, is indigenous to Africa. It is also known as dinawe (Ndebele), dinaba (Shangaan), imbumba (Zulu), monawa or nawa (Pedi) and dinawa (Tswana). Cowpea leaves nitrogen in the soil and therefore has a beneficial effect on the follow up crop. Prof Auerbach’s postgraduate students are researching its value in crop rotations, the effects on soil microbiology and access of traditional producers to organic markets. Prof Auerbach is increasingly sought after to address international symposiums on food security and organic or natural farming systems. In June 2018 he addressed the Organic Plus Project in Padua, northern Italy, (he serves on its Scientific Advisory Board) and the 24th International Sustainable Development Research Society Conference in Messina, Sicily. In September of 2018, he taught at a summer school in Oldenburg, Germany, which eight Mandela University postgraduates attended, as well as German and Tanzanian students from partner universities. He says that over the past decade, food systems research has developed dramatically, and organic farming systems have become mainstream. He looks forward to working with the AEON Earth Stewardship Research Institute at Mandela University on sustainable food systems over the next ten years.